Wearable technology and wearable devices are future of technology. The size of wearable market is expected to cross $8 billion in 2018. Google has already entered into market of wearable devices by launching Google Glass. Google’s project contact lens is also well-known. Apart from these, Google is working on an android watch. Google Watch will be another product in wearable market by Google. Google watch will be solving the inconvenience that a user face when he use a wearable device that has a smaller screen. As you know that last year Samsung brought Galaxy Gear into market. You can receive calls and notification of your messages and emails on that. However, to type a reply you have to use your smart phone or tab of Samsung. The android watch by Google consists of multiple sensors and these sensors are capable of creating a virtual input area on a wearer’s forearm, wrist, or the back of his hand. Using that virtual input area you can control the android watch of Google very efficiently. The problem with Samsung gear was that it was having smaller interface and you can only read emails or text messages on it. Google is solving this problem and you can read your emails on interface of Google’s watch and can draft a reply also. For email drafting and similar tasks it generates a virtual keyboard on your hand and you can draft an email very easily from that. Incorporation of accelerometer sensors will be enhancing user experience. It toggles the user interface of watch between watch mode and user interface mode. It provides right-click and tap inputs and helps in saving power also. You can operate varieties of applications on your watch interface like Facebook, email applications, music player etc. 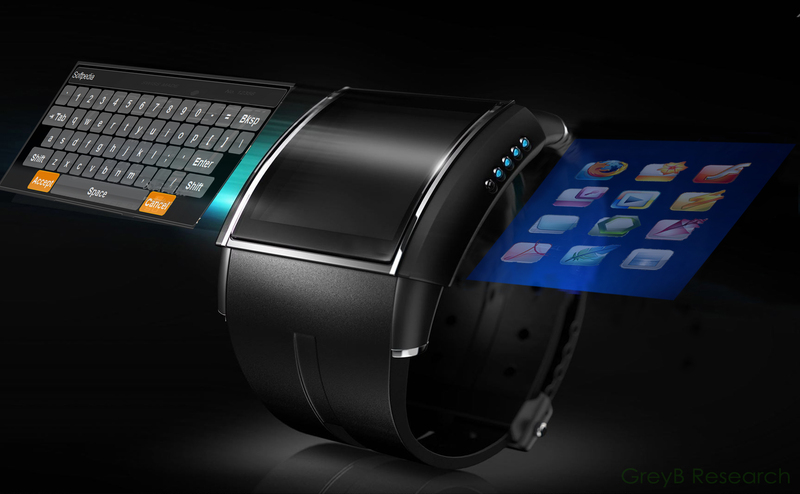 The watch provides you a larger virtual keyboard and you can use it to edit documents, and to draft email replies. Therefore, if you feel inconvenience while drafting an email on your smart phone, you can use Google Watch as it provides a larger keyboard than your smart phone. You are listening music and want to change the track? It’s very simple in Google watch. You can play next track by pressing you fingers on strap of the watch. You have to swipe your fingers back and forth on the strap for fast forward or rewind. Therefore, when you will be doing exercise and want to change music track you don’t have to remove your smart phone from your pocket. You can control it directly from your watch. The watch consists of multiple sensor-emitter pairs those create a touch input interface on wearer’s hand. It generates touch interface just adjacent to the watch. The camera and accelerometer sensors detect user’s finger movement on generated input area. Google is making the watch very innovative. You can unlock your smart phone by placing a key on touch interface area created by watch. Similarly if you want to open calculator on your smart phone or tablet then you just have to place a coin in touch interface that is generated on your hand by the watch. The crown of the watch plays an important role in changing the functioning of your watch. When you will push the watch crown inward it will function like a normal watch and when you will push it outward it will function as an input device. You can control cursor on your smart phone or tablet by rotating the crown. The strap of the watch is also used to control various function. You can change music tracks and can select text by performing swipe gesture on watch strap. The battery problem was one of the major issues in current smart devices. Google has addressed this problem also by using accelerometer sensor. It helps in power saving. The accelerometer sensor senses the movement of the watch and change the watch functionality accordingly. For example, if the watch is lying ideally somewhere from a long time then it displays time only and shuts instead of user interface of the watch. It also sends other sensors in low power or shut down mode to save power. Lots of smart watches are already rolled out by many major companies. What do you think – for what Google and Apple are waiting for? While Apple has announced that they will be launching their smart watch in 2015, Google has made no such announcement yet. However, this patent application is narrating a completely different story. What do you feel about this smart watch of Google? Don’t forget to let us know your responses. The comment box is waiting for you. Stay tuned to GreybMusings for more amazing stuff . Find us on – Google+ Facebook Page. Pinterest. I will love to purchase this watch. Keep up the truly amazing posts. I love reading things like this. We have been bringing such posts for two months and we will continue this in future also. I recently read that some scientists at an American university have developed a way to power batteries using the lactose from human perspiration, to power some medical sensors. I’d like to see Google Watch using a similar mechanism to lengthen battery life. I already hate it on other devices when they wake up for half a minute or longer after some time of not being used, checking for emails, updating the weather data and whatnot. Having the full functionality always on and using a power source which would otherwise be wasted is IMO likely to yield a smoother and more pleasant user experience. You should file a patent for this.